Welcome to the chronicles of our Romanian Mission Trip! Allow me to fill in a little of the backstory prior to launching into the details of our trip. My wife, Ellen and I are passionate followers of Jesus Christ. Both of us have chosen to accept the free gift of salvation that God has given us through His son Jesus earlier in our lives. We met at Texas A&M University. We dated for two years, and during that time, were not honoring the Lord in most aspects of our lives. While we were still dating, Ellen & I became pregnant with Lauren. When we found this out, Ellen’s parents and brother were getting ready to go on a short-term mission trip to Romania with Global Missions Fellowship (now e3 Partners – www.e3partners.org), led by GMF staff member & church planter, Sam Ingrassia. We decided not to tell her parents then, because we knew that they would scrap the trip. When they returned, we told them that we were going to have a baby and wanted to get married. Within 3 weeks, Ellen and her mother planned a beautiful wedding and saw God do some amazing things in the process…lots of things that were “too coincidental” to be coincidence…it was God all the way. We were married 12 years ago today (as of the date of this writing), on August 11th, 1995. Through it all we experienced God’s grace very tangibly – not the least of which was through the birth of our precious daughter, Lauren, who was even born ON her due date (February 8th, 1996). Looking back, God was absolutely the Hero of our story and was recapturing our hearts…He revealed Himself to us little by little along the way. We give all the glory to Him and feel truly blessed! Shortly after Ellen & I were married, her parents gave us a Christmas gift of a short-term mission trip – we could go wherever we’d like with Global Missions Fellowship (e3 Partners) and they would foot the bill, although they preferred that we try and go on a trip with Sam Ingrassia. I thought it was absolutely the worst gift I had ever gotten. I mean, we were newlyweds and broke, with a brand new baby. The cost for us to go was thousands of dollars that we could have used for SOOO many things! But…this is where we were. I went – begrudingly – with Ellen (and Sam!) to Londrina, Brazil. In short, God used that week to change my life and captivate me for good. I saw what a huge God we have and how much He loves me – and how important/necessary it is for me to depend on Him. He gave me a glimpse of His power and might and His relentless, loving pursuit of the human heart. Our lives have never been the same since! We have been on numerous short-term trips since, and all have been special and revealing in their own ways. Ellen and I looked forward to the time when we could take our children on trips like these and be a part of what God is doing, together as a family. By the grace of God, Lauren trusted Jesus as her Lord & Savior a few weeks prior to turning 4 years old. Our son, Dylan, has also made the choice to accept Jesus as Savior (He is now 6 years old). FAST FORWARD – Lauren turned 11 this February. Ellen & I had been praying about the right time for Lauren to go on a short-term mission trip, and had decided that we would like for her to go prior to entering middle school…for a number of reasons. Most of all, we wanted Lauren to have the experience of serving Christ by fullfilling the Great Commission (Matthew 28:16-20) and also, to see what God might do with her/reveal to her as a result. We decided that we would again go with e3 Partners and we would go with our good friend Sam Ingrassia. I asked Ellen for permission to take Lauren by myself, so that we could have some highly concentrated and very meaningful, father/daughter time. She agreed, as long as I didn’t let Lauren out of my sight, ever. So excited about Jason and Lauren (3rd generation!) going on the Romania campaign! Amazing to think back Jack, that after you returned from Romania years ago – you learned about Lauren – Now Lauren is going to Romania in the name of Jesus! When Jack shared this with me, I wept, and marvelled at all that God has done with Lauren, Dylan, Ellen and me since 1995. WOW. Really put this trip in perspective for me!!! Lauren and I raised our support to go to Romania. We want to thank each and every one of you who contributed financially for us to be able to go to Romania in the name of Jesus. A great many more of you committed to pray for us and the various aspects of our trip. THANK YOU ALL!!! We feel truly blessed to have been a part of what God is doing in Romania. As a result of your sacrificial giving, Jesus used Lauren and me personally to share the gospel with 41 people. TWENTY-ONE of whom chose to trust Jesus as their Lord and Savior!! Glory be to God!! Please join us in praying for the Lord to grow these new believers and to continue to pursue all of those who we talked to. The purpose of our mission trip was to partner with existing Romanian churches to extend their reach into new “mission points” by going door to door in these new areas and telling people about the Good News of Jesus Christ, and how He desires to have a personal relationship . We did this a lot through the use of a neat little tool called the Evangecube (Check it out on the right hand side under “The Cube”. Click on it!) which helps to tell the gospel story in an easy to understand, visual way. The following is a daily journal of our journey. We have also uploaded pictures that help to put faces with names & dates that we discuss. We hope that you will enjoy reading about what God has done, in us and through us! May our Lord Jesus Christ reveal Himself to you in brand new and exciting ways this year! Please let us know how we can pray for you now! Our flight from DFW to Chicago went off without a hitch. Little did we know that that would pretty much be the very last hitch-less flight on our whole trip!! We had a pretty substantial layover in Chicago. Just prior to boarding, we were told via intercom that there would be a slight delay due to a technical malfunction on the plane…and if they couldn’t fix it, they were going to have to switch out planes – this delay should take about 45 minutes to one hour. Okay, we thought, that’s nice…glad they are going to work out the technical malfunction prior to an overseas flight…that’s always good. After the first hour went by, the next “intercom installment” went something like, “We’ve found the cause of the technical malfunction and we are working dilligently to fix it. There is a defective ‘part’ that we need to replace prior to departure,” or something like that…they just kept refering to “THE PART“, which started to become humorous, and yes, annoying. But hey, we thought, if “THE PART” was part of the the landing gear or an engine, we are all for taking the time for you to check that out, etc. After the next hour went by, our next “intercom installment” was given by someone who seemed to be more in the know. Apparently, enough disgruntled passengers-to-be had given the check-in counter attendants enough mess that they replaced the announcement person who was expertly vague about the situation with someone who was confident enough to give a little more information…so, we found out that “THE PART” was something having to do with the refrigeration unit that kept the food cold. Also, of course, “THE PART” was wedged in a very cramped area that only person could get to. Another hour goes by…. Finally, at 9PM, we were able to board and our flight from Chicago to Munich, Germany was uneventful – Praise God. I passed out in front of our in flight movie selections, while Lauren – who was unable to sleep really – surfed the channels. We were unaware of how a small, 3 hour delay could alter our direct flight plans…. Once we arrived in Germany, we quickly realized what the 3 hour delay in Chicago cost us. There was a group of about 15 of us that flew together from Chicago to Munich, but that was the end of our travelling together. When we got to the Lufthansa desk , they told us that the primary direct flight to Timisoara, Romania was overbooked and we were not able to all get on that flight together. So, Vicki Ingrassia (the wife of our team leader, Sam Ingrassia, who was already in Timisoara) worked tirelessly with the ticket counter attendant to get us some connections that would work to get us to Timisoara. Our group of 15 ended up being splintered into 2 groups. One larger group that was able to get on a later flight to Milan, Italy that then had a late night connecting flight to Timisoara. The second smaller group included Vicki, another campaigner Donald (from South Carolina), Lauren & myself. The four of us would spend the night in Munich (courtesy of Lufthansa) and then take two separate flights out on Sunday. Vicki & Donald would leave Sunday morning on a flight that had one connection prior to making it to Timisoara. Lauren and I would not leave Munich until 8PM Sunday night, but get to fly directly to Timisoara. Do you have tired-head yet? We did for sure! However, thankfully, we were all taken care of and all (eventually) made it to the final destination of Timisoara. We were able to get our luggage and get on a shuttle that took us to our hotel (Aribelle Sheraton) on the outskirts of town by the airport. We had a much needed shower, dinner and took a walk through the small village area near the hotel. We came upon a playground and played on the swing, merry-go-round and tetter-totter. Eventually, we made it back to the hotel and called it a night. We woke up at about 3:30AM, because my BlackBerry kept buzzing. Sam, our team leader, had sent me a text message that two of the larger travel team (Tom & Mike) had not made it from Milan, but the other four team members had made it safely to Timisoara. Lauren was already awake, as she was having trouble sleeping. So we talked and prayed and sent some text messages to my wife Ellen, who was still awake (it was around 9:30PM or so in Dallas), letting her know about what was going on and to ask her to pray for us as well. Lauren and I talked about spiritual warfare a little and that perhaps this was part of the reason for the travel mayhem. The enemy for sure was not too happy about our mission, as he knew that we would be bringing the light and love of Jesus to the lost in Romania. Literally, we would be “reclaiming enemy occupied territory for Jesus, and advancing the King’s kingdom” one heart at a time. Of course satan wasn’t interested in that! And then, my favorite transitional words in the Bible popped in my head, “BUT GOD…”. Yes indeed. In my estimation, God was using this for His greater glory somehow, I just knew it. He had all of this under His control, and nothing was going to happen to us that He didn’t at least give permission or allow to happen…that’s just the way it works! We were able to get back to sleep for a bit. Later, we got up, showered, had breakfast and loaded up on the shuttle and went back to the airport with Donald & Vicki. We said our goodbyes there, as they had to catch their flight, and we had the rest of the day in front of us!! The night before, we had read about the many different places to see in and around Munich, so we decided to take advantage of the time God was giving us to try and take a tour of Munich. We checked our luggage at the terminal, changed some dollars into euros, bought some train tickets (finally – I was a little ticket impaired!) and headed down to Marienplatz where we were told that all of the tours left from. Lauren and I were excited about heading out on our own little side adventure! When we got to Marienplatz, we found no one there really. It was Sunday morning afterall, and apparently we were still a little early for any hustle and bustle. We walked around for a few moments and found a familiar site…THE GOLDEN ARCHES! We stopped in to the McDonald’s and had some food and coffee – just killing some time. When done, we went back to the Marienplatz square and hooked up with a tour guide named Chris (from England) and paid 10 euros for a walking tour of some of the older sites in Munich. It was a lot of fun, and gave us something to do to kill time while we waited for our 8PM flight to Timisoara. We saw the famous Glockenschpeil (under renovation) and tons of other interesting items. Munich is known for beer, the birthplace of Nazism and Hitler’s rise to power, 1972 Olympic shooting of 11 Israeli athletes, the headquarters for BMW (Bavarian MotorWorks), the headquarters for Siemens, etc. You can check out the pictures of a number of the sights we saw. We finally made it back to Marienplatz, had some lunch and got on the train back to the airport. We were pretty tired from all of the walking (a little over 2 hours of it), but we were glad to spend the time together that way! We picked up our luggage, got checked in, bought some post cards and a FC Munich t-shirt for my son, Dylan, ate again and then crashed at our gate. Our flight left relatively on time and we made it to Timisoara at about 11:20PM. We were glad to be there! Our campaign leader, Sam Ingrassia, met us at the airport. We finally got checked in to our hotel, and fell asleep about 1AM…needless to say, we slept well!! Short night! Lauren & I woke up about 6AM to get ready for breakfast and the day that lay ahead. As we were driving to the hotel last night, Sam told me that I would head up the team in our mission point. There would be three other American’s from Firewheel Church (Bill DeFord, Amanda Ramirez & Kandace Tappen) on the team, none of whom had been on an e3 Partners campaign before. Should be awesome to see what the Lord has in store for each of them too! After breakfast, Sam lead the entire American team (there were a total of 50 Americans, from about 10 different churches around the country…representatives from Texas, New Jersey, Missouri and South Carolina to name a few) in a devotional. He spoke from Matthew 20 where Jesus gives the parable of the Laborers in the Vineyard. In it, the landowner has a short window of time to take in the harvest and he needs help getting everything done. He hires men throughout the day – at the start of the day, the 3rd hour, the 6th hour, the 9th hour and finally at the 11th hour. The heart and the generosity of the landowner is what this story is about, as the landowner chooses to give each worker the same wage, no matter how long he worked. Sam cautioned us on questioning God’s generosity and pointed out that we are “11th hour workers” here in Romania! Many before us have spent years and years working in really tough conditions – especially during the years under Communist rule. We are now coming in, during the “easy times” and working. God’s economy is truly different and as He says in Isaiah 55:8, “For My thoughts are not your thoughts, neither are your ways My ways,”…I am very thankful for that. We met Pastor Mocanu, who would be leading us in the two mission points during the week – Cenei (pronounced Chenay) and Sacalaz. We would spend Monday and Tuesday in Cenei, which was about 40 minutes outside Timisoara. Our goal was to break up into smaller teams of 3 to 4 individuals with an American on each team and a Romanian translator, along with other Romanian nationals to come along, to pray and interact as well. When we got to Cenei, we spent time getting to know each other – there were about 10 or so Romanians who had gathered to help (Diana, Danielle, Dana, Able, Danny, Marinel, Marius, Gabriel, Svetlana, Andre). Some spoke English and some didn’t, but all were coming to pitch in. Once we all had met, we talked about how we would divide up the village to canvas it. We then broke up into smaller teams. Lauren and I were on the same team along with our translator Danielle and Danny, Pastor Mocanu’s son. Danielle is about 17 or 18 and speaks English well, while Danny doesn’t speak any English. By a show of hands, I asked how many in the entire group had ever done door to door evangelism. Not many raised their hands. Next I asked who was nervous about doing it…almost everyone raised their hands! I reassured everyone that the people that we would encounter today on the street were “Divine Appointments” and that the Lord would take care of all the details. I gave them a quick run through of the Evangecube to show everyone the flow of the message/story. We all got in a circle and prayed – in Romanian! Not sure what was said, but I knew it was good. Then we set out. Lauren & I visited with a total of 7 people, none of whom were interested in accepting Jesus as Savior. I was bummed on one hand, but on the other, we were planting seeds…from there, it was God’s job to grow them. Most of who we talked to were pretty closed to new spiritual ideas. Personally, I underestimated the hold that Orthodoxy still has on this village. The rest of the team had some success however – Amanda, one of our first timers, got to lead 3 people to Christ! Lauren & I were extremely exhausted. I was very proud of how Lauren did! We slept VERY well…much needed rest. Woke up and read some historical information on Romania, the Revolution, the Orthodox church, and prayed. Sam had given me a lot of this information Sunday night, but I had not had time to look at any of this information prior to Monday morning. As I was reading it, the Lord really broke my heart for the Romanians. I cared about them in a whole new way and really wanted to understand them better when meeting with them today. I came away with a feeling that for many of them, it was probably very hard for them to trust anyone. Just 19 years out of communist rule, I felt like it was probably still very difficult for many Romanians to trust anyone new…or each other for that matter. At his peak, it was said that Nicolae Ceauşescu had 1 out of 4 Romanians acting as informants for the Secret Police. If you were considered to be someone who was speaking against the government, you could get hauled off to one of their concentration camps and most likely, never heard from again. I felt like our number one priority would be that we should love them to Jesus, giving the Gospel, but only using words if necessary. Love was the key. Seems like a pretty “duh” kind of statement, but that morning it just hit me a lot stronger that the love of Jesus was the only answer for how to get through to a hardened, untrusting heart. We would step out in faith, love the people in Cenei and let God sort out the details. We went to breakfast and then our devotional, where Sam talked about the power of friendship through the story in Luke 11:5-13, where Jesus gives the story to illustrate persistence in prayer. * I learned to see beyond the person’s appearance. * (Gabriel’s comment) I haven’t had the courage to talk about God to others before. I didn’t think they would want to listen. I realized that those thoughts were false and were just made up in my head. Yesterday was a real encouragement for me! * We have to have patience and be a good listener first. * People tend to put their guards up, saying they don’t want to go to another religion. Most say they know God because they want to get rid of you. * It was a good experience, I never thought I would have the courage to go house to house. * We talked to one lady for 1/2 hour. She was – along with others we talked to – looking at our behavior. This lady was upset with Christians because of something that happened previously…our attitude is important towards them…we have to pursue them in relationship, as they are all looking for love. I closed out by encouraging them all that it was no accident that they came and participated in this work yesterday…God chose them, before the beginning of time to do what we just did. These are all divine appointments…we have no idea when we step up to the door who the Lord has appointed for us to talk with. We must pursue everyone we meet and see with His love flowing through us. We talked a little about John 15 and how our job is to abide/rest in Jesus (when we trust in Jesus as Savior, we are grafted in to a union with Him – a real forever relationship), the True Vine and His job was to cause His love, life and strength to flow through us and produce fruit. We as branches can’t produce fruit – it is not our job! We are just fruit bearers, and the fruit is not for us, but for others. Jesus has promised that he would produce the fruit!! We then prayed for boldness and compassion and went out. – The first house we went to – a lady named Tatiana chose to trust Jesus as Savior! She wanted and needs a Bible. – The 2nd house – we talked to two kids, Christian & Dana. They wanted to talk, but were preparing lunch. They asked us if we could come back after they finished cooking. We said we would. – The 3rd house – we talked to two other young men – Julian & Eeche and both trusted Christ! We stuck around and talked to Eeche’s mom & dad for awhile and had a great conversation about fishing and television shows. – At lunch we had some great conversation with Marinel about the book “Waking The Dead” and “Epic” by John Eldridge (www.epicreality.com) and how God is telling a grand story and we all have been given a critical role to play. – After lunch, we went back to Christian’s & Dana’s house and Lauren led them both to Christ by herself with no help from me!! – We ran into Lily – a lady we had met at the bus stop Monday afternoon and told that we had reading glasses – and she had brought both of her children with her to get fitted for glasses (we had purchased a ton of magnifying reading glasses in the States and brought them with us as a bridge building effort). We shared the Gospel with her – through the Cube – and she said that in the past she had trusted Jesus as Savior and was very encouraged. – For our evening service, we had 12 people show up! There was lots of signing and I talked about the black grapes that we noticed everyone have in their yard and brought them back to John 15 and Galatians 5 to talk about our relationship with Christ as followers of His. We gave out the glasses to those who wanted them afterwards…it was a big hit. – As a group, we drove to a pizza place for dinner. It was really good! On the way to the restaurant, Marius told me that over the past two days as a translator and just hearing the Gospel message over and over, he had made a choice to trust Jesus as his Savior!!! Praise God! We all encouraged him and celebrated his decision. In all, we tallied that as a collective team, we gave 29 Gospel presentations on Tuesday and 8 people decided to accept Jesus as Savior…including Marius! It was a wonderful day. It was our last day in Cenei as we had another mission point to head to – Sacalaz. The team was sad to leave Cenei and some of the wonderful people we met and worked with there…it is amazing how close you can get to folks in a short time! However, we were also excited to see what the Lord had in store for us at Sacalaz. Independence Day in America! Wow, how we DO take that for granted, I thought. I was reminded about a talk my good friend Scott Wolfe gave one time about Dependence vs. Independence…we strive for independence in so many ways, but “God’s economy” is built on dependence! A difficult concept to wrap our heads around many times. After breakfast, one of the main Romanian pastors offered the devotional out of Mark 12:28-34. He asked, “What happens when a Christian loves God?” He went on to say that Jesus – in this passage – condensed all of the Scriptures into one phrase – LOVE GOD…from this, everything spokes off of this. He said the most important thing is not so much that we believe in God (for the Bible says that even the demons believe in God), but LOVING THE GOD IN WHOM YOU BELIEVE. 1 Corinthians 8:3 says, “…but if anyone loves God, he is known by Him.” When I believe in God, I know Him (or at least know about Him), but when I love God, I know Him AND He knows me…it’s more of a two way relationship! When you love God: You love yourself, your enemies, you love His word, you like to pray, etc…. Very powerful stuff. We loaded up and got ready to head to Sacalaz, a community about 15 minutes from our hotel. Sacalaz is a community that Mocanu has been serving for about 5 years now. He is considered – from a popularity standpoint – much like the mayor of the village. LOTS of people know him there and the church is much more well known. As we were getting ready to load the van, Mocanu introduced me to a new translator, Andrea. He told me that her neighbor (who goes to Golgatha Church) had heard about the work that we were going to be doing and that there was a need for translators. She knew that Andrea was a neat girl, but not a Christian. Andrea accepted the opportunity to come with us because she thought that she could help, and also brush up on her English…so she loaded up with us. Overnight, Kandace had gotten very sick and was unable to join us. As we were driving to Sacalaz, Mocanu asked me if Lauren would be willing to lead her own team, separate from me to make up for the loss of Kandace. I was obviously concerned about safety for Lauren on the one hand (also because, remember, my wife had agreed to let her go only if I never let her out of my sight), but after talking to Mocanu, understanding the area of Sacalaz a little and knowing who she would be paired with, I felt pretty comfortable in her going…and we wouldn’t be that far away from each other. Once comfortable there, I considered the fact that Lauren was really ready – from a spiritual standpoint – to make this transition. I felt that the Lord had some neat things to teach her that He could only teach her when she was “out from under my wing”. Over the past two days, I could see that she was chomping at the bit to “run the conversation” instead of me doing it…she would always be whispering in my ear things like “Daddy, you need to say this….” or “Daddy, can I ask them if they want to accept Jesus yet?”, etc. It was time. I asked that the Lord would protect her and reveal Himself to her through this. When we got to Sacalaz, I presented Lauren with this new proposition of her going out on her own. I didn’t know how she would feel about it – and I was not going to force her to do it – but (not surprisingly) she jumped at the chance! We met her new translator, a sweet young lady named Astrid, who spoke English very well, Danny (who had been with us for the past two days and, I was confident, would really watch out for her…although he didn’t speak English), and a younger boy named Andre. We met as a big group, got to know some of the new Romanian/Sacalaz volunteers, prayed for the Lord to bless our time, and went out. I went off with Lauren separately and prayed with her, encouraging her that she could do it and to rely on Jesus to give her the words to say and when to say them. She was excited! I went with Danielle and Andrea. We turned down one street and found about 3 boys (and 2 more who came soon after) who were playing frisbee. We stopped to talk to them, showed them the Cube, and all 5 wanted to accept Jesus as Savior! We led them in a prayer to receive Christ. When we finished, I worked with Andrea to talk to another young man who had arrived on the scene…at first he appeared too cool to talk to us, but we had a nice conversation. There was much distraction on the street at that point, and I could tell that while he seemed genuinely interested in what we were talking about, he was also being pulled back in to the “life” he had around him. We asked him if he wanted to accept Jesus as Savior, and after awhile talking about it, what that meant, etc, he decided that he was not ready. I told him that I could respect that – choosing to follow Jesus Christ is not a decision one should take lightly – but that he should also consider that it was no coincidence that God had brought me to that street corner on that day, and that he had been there at that time to hear THAT message. NO COINCIDENCE at all. This was appointed by God. I jokingly then said, “No pressure! Really.” I invited him to come to the church Thursday night if he had other questions, that we would be there and would love to continue the conversation. He thanked us and took off. At that point, the street that we were on became pretty deserted – compared to all the activity we had experienced right as we turned the corner. I took that opportunity to talk to Andrea. I asked her what she thought about all that we had been talking about with these different people. She said, “I think it’s nice, it’s a nice thing to talk about”. I then asked her if she believed what we were talking about. She said, “Yes I believe in God and in Jesus.” So I said, “Okay, if you were to die today, and Jesus were appear to you in front of the gates of Heaven, and He asked, ‘Andrea, why should I let you in to my perfect Kingdom?’, what would you say? Where would you go and why?” Andrea thought for a moment and said, “Well, I am a good person and I go to church, but I don’t think that I can say for sure if I would go to Heaven. Only God knows that.” I responded, “Andrea, what if I told you that God wanted YOU to know how you could go to Heaven – without a doubt – would you be interested in finding out about that?” She said, “Yes, I would.” So, we talked some more about how God loves us…how He created us and has longed to have an intimate relationship with us. However, because of our sin (Romans 3:23 “ALL have sinned and fallen short of the glory of God.” and Romans 6:23 “The wages of sin is death.”) that we are born in to, we are separated from Him…He can’t allow sin to enter is perfect and holy kingdom. But because God loved us so much, He provided a way for us to spend eternity with Him, through His son Jesus Christ. God sent His Son, Jesus, to come to earth, live a perfect life and die on the cross as the perfect sacrifice for my sins, your sins, everyone’s sins. Through His death we can have the forgiveness of sins – once and for all. Through His death we can be justified and reconciled to God…but we must make a choice. In John 14:6, Jesus says, “I am the way, the truth and the life. No one comes to the Father, accept through Me.” Jesus is THE WAY that God provided to have a relationship with Him…not a way, but THE way. I told her that if there were other ways for us to get to Heaven, that Jesus died for nothing (Galatians 2:21). Through God’s grace, He gave us this gift…we have done nothing to deserve it, but because of His grace and His mercy, we can accept this gift, and be made holy, because of what Jesus has done. I used the analogy – when you wake up Christmas morning and run down to the tree and look for presents that have your name on them, when do those presents really become yours? When you take possession of them, right? I could point to that present under the tree that has my name on it and say, “Yep, that’s mine! See, it has my name on it!” But until I take the gift, unwrap it, and possess it as my own, I don’t really “GET it”. It is like this with Jesus. God has given us the gift of eternal life through His Son Jesus. Jesus paid the price for EVERYONE’S sins, and the forgiveness of sins is wrapped up in this gift. BUT, unless you accept Him as your Lord and Savior, you don’t possess the gift. I asked her…would you like to accept God’s free gift of salvation today? Andrea said, “Yes, I would.” AWESOME! We prayed there in the street and we rejoiced at what God had done. We walked back to the church for lunch. When we got back to the church, I found Lauren there, who looked a little upset. I asked her how the morning had gone for her and she said okay…she had gotten to lead 3 people to Christ. I was thrilled! She looked less than happy about it though. When we finally boiled it all down and talked through the “smokescreen” (she and I actually got into an argument that I won’t detail here, but I wasn’t really proud of it – I was too impatient with her! ), she wasn’t having as much fun because she didn’t have a strong relationship with any of her team. I was so concerned about the safety aspect of sending her out on her own, that I overlooked the relationship aspect. She wanted to be with me in the afternoon, so that’s what we did. I encouraged her though, that even though she had not felt as connected to her team, God STILL used her to draw 3 people to Himself! Wow. Still, I thought that we should hang together in the afternoon. I was very proud of her for stepping out, trying something new – even though it was outside of her comfort zone. She did an awesome job!! We went in, had lunch, and as a group celebrated Andrea as being our new sister in Christ…we cheered her and had a great time. After lunch, Lauren, Andrea, Danielle and I went back down the same street I had gone down earlier with Andrea and Danielle. We ended up only talking to 2 people, but had a great conversation with one lady – Dora – for 2 hours! She had tons of questions – great ones – saying that she was confused after having talked with Catholics, Jehovah’s Witnesses, 7th Day Adventists, Orthodox, etc as to what the central issue was. All claim to be Christian. We talked about a lot of things, but tried to bring it back to the fact that JESUS is the focus. If any religion/denomination puts a heavier emphasis on something else other than Jesus, then it is suspect, and should be questioned. If that religion/denomination communicates that the way to Heaven/salvation is anything other than Jesus Christ alone or if they preach Jesus plus something else, then it is contrary to what the Bible teaches. When I told her that God wanted to have a personal relationship with her through His Son Jesus, it was difficult for her to accept…in fact, she couldn’t accept it. She said that she had done too many wrong things. I pointed out that Saul, before he trusted Jesus as Savior became Paul, murdered and locked up Christians! She was still wrestling with all that in her own life. I am thankful for Dora and pray that the Lord will continue to reveal Himself to her by whatever means necessary. She said that she would enjoy having Mocanu come visit her and talk some more. That was cool. We went back to the church and loaded up to grab some dinner. Quite a full day! We recapped and as a team we “CUBED” 24 people, 12 of whom made a decision to trust Jesus as Savior!! Thank you Lord! When we got back to the room, Lauren and I talked about the day. I apologized to her for getting upset with her. I asked her if perhaps we could arrange it for her to be with Diana as her translator, would she be interested in going it alone again Thursday…I made sure that she knew there was no pressure to do so, but I still felt as if she was ready. There were just a few too many “new” things that were in the mix this morning. Her face lit up and she said, “Yes, I’d really like to go with Diana!” I told her that we would have to pry her away from Bill (Diana had become like a daughter to Bill over the week – she had been his only translator), but we would see what we could do. We slept hard as usual. Lauren and I woke up, got ready, prayed for the day and went to breakfast. Today would be our last day of going door to door. It was threatening rain, and quite a bit cooler today. In our devotional time, Sam told us that it was time today to work on “passing the torch” to the Romanians. Our job, as short-term missionaries, was to be the “match” that would help to light a flame that was intented to keep burning, long after we left. The e3 leadership team had been working on this prior to our arrival and would continue to help long after we left – to train, encourage and help disciple the leaders that would then need to follow up with those we came in contact with during the week. * We like to put labels on people: “Easy” to talk to (children, women, old people) and “Hard” (macho looking men/guys that don’t seem to let their guard down. Because we put labels on people, we tend to focus on “easy people”. However,”hard people” have the same importance. I haven’t had the same courage to go talk to “hard people”…it is very important to listen first, talk later with this group. * When we are in small teams, some have success and some don’t. However we must consider that we are one big team and look at the overall work that we are doing. * We (Romanians) have felt encouraged. You Americans were helpful, because you come from the outside. The ministry is not only ours, but you have picked it up as yours also – you share our joys and failures with us. * (Andrea) This was my first experience and a very pleasant one. I’ve learned that Jesus is the way to heaven. * (Kandace – who was sick Wednesday) We all have gifts that God has given us and He will use them to His glory…it is evident by who He brought to me on the street this week. People (in general) are very lonely. Being sick yesterday bothered me – I couldn’t be here with you. BUT He did use me to pray for the team. I was grateful for that even though I couldn’t be here in person. * (Amanda) Yesterday, we were talking to a man on a bench. His friend kept coming closer, but he didn’t want to engage in the conversation and really get involved. The man on the bench trusted Christ as Savior and then went to tell his friend! It is important for us to encourage these people to to share what they’ve learned with others. * (Bill) I didn’t feel like going out yesterday…the 1st half of the day was hard. However, God blesses our efforts. We need to just “show up” and allow God to work through us as He sees fit. * (Lauren) I learned that I can’t save people. It is God that speaks through you. He is using you to share His word to others. * (Danielle) I learned that we have a greater responsibility when we share the word. We have to be examples for those around us. People look to us for something different. I have seen that people who have questions are really interested in God…they are searching. I had goosebumps talking to Dora yesterday and realized that I need to come with stronger arguments and not be “shallow” with the word of God. Dora said that she was confused in her faith. She hoped that we were the answer she was looking for and she said that we were sent from God. We need patience with people and even the way you look at people. God has done the work of preparing the hearts and minds of those in Sacalaz. God will be the one who draws us to those He has prepared. God will be the one to give us what to say in His way and in His timing…and it will be God who will do the work of fertilizing the soil after we leave! Our job as faithful workers of the harvest is to just be the vessel that carries the message with love and compassion. Therefore, if God is for us, WHO CAN BE AGAINST US??? Lauren went out with Diana and had a wonderful morning. Three children they talked to trusted Jesus as Savior! Danielle and I went out and visited with 3 people – the first listened to us a little bu then shut us down saying that we just believe different things, and went in the house. She then pointed to an old man sitting on the sidewalk and said “don’t try talking to him, he can’t hear anything.” We decided we would go ahead and talk to him anyway. His name is John and he is over 90 years old. As we started to talk/yell with him, his wife Anna showed up. We told them what we were doing and who we were with. We also invited them to come to the church that night and mentioned the reading glasses we were giving away. She was interested in that, but it appeared that they wouldn’t be able to come to the church, that evening anyway. They did need new glasses though. So, I ran back to the church, got the two bags of glasses and ran back, and we did a little “house call”. After we found some that worked for John and Anna, we shared the Cube with her. She made a decision to trust Jesus as Savior! We then had a conversation with John, that went on many different tangents. I am pretty sure that he was able to understand us an for sure heard us, but it is possible that he had a little dimentia going on. However, God is bigger than that. I pray that He will use Anna to lead John to a saving knowledge of Himself through Jesus. We gathered back up for lunch and had an extended time sharing. Ovi shared his testimony and so did Astrid. Both were a real encouragement. After lunch, I decided to follow Lauren and take pictures while she and Diana shared with others. We ended up having Danielle, Diana, and Lauren in a team…Diana played guitar on the front steps of the police station to draw others in, and then Danielle and Lauren would approach people who were crossing their path. Lauren was joking around saying that her new tactic was going to be to step out in front of people and say “STOP! In the name of the Lord!”. Not sure that would have had quite the desired effect, but we did have a good laugh! Lauren and Danielle talked to two sets of women. The first set listened to the Cube presentation, and said they believed, but needed to head home and rushed off. The second set – Olympia and Maria – talked with our girls for a long time. Danielle finally waived me over to try and answer questions concerning Revelation (yikes!!!) and other things that they were dying to know. We talked for a lot longer. They specifically wanted to know about praying to God through a man (priest) – like in the Orthodox church. They wanted to know what I believed. I told them that I assumed the priests to be good men, but that Jesus died for everyone and calls those who trust in Him as Savior “friends” (John 15:14-17)…I like to think that I don’t need a “middle man” to talk to my best Friend! Also, in Hebrews, Jesus is referred to as our High Priest – once and for all (Hebrews 4:14 – 5:10). The Holy Spirit, who lives in every Believer, intercedes for us on our behalf (Romans 8:26-27). So, again, I am sure that these may be good men, but those who have trusted in Jesus as Savior, have DIRECT ACCESS to God, 24/7/365. God Himself has made it so! Amen! Olympia & Maria finally ended up trusting in Jesus as their Savior!! It was wonderful. God used the whole team to draw them to Himself! We gathered back up and had our evening service at the Sacalaz church. There were quite a number of folks who came. Mocanu had asked Lauren and Kandace to give their testimonies and for me to give a quick lesson. I had nothing prepared and really don’t even remember what I said. 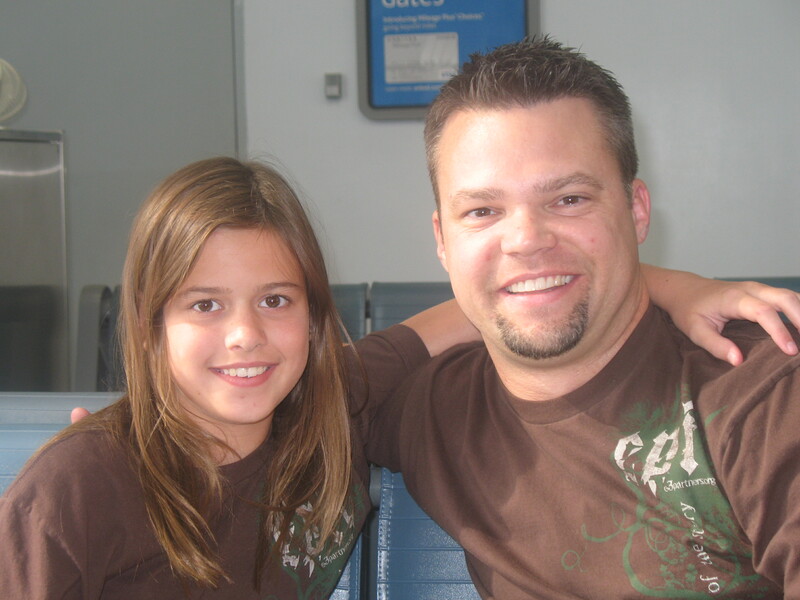 I do remember having the priviledge of introducing Lauren as my daughter and crying through the explaination of our family testimony of how Lauren came to be and how God had turned all things in that situation into good, magnifying His glory. Lauren and Kandace both did a wonderful job and then Mocanu spoke as well. At the end, we spread out all of the reading glasses on the floor and had everyone take what they needed for themselves and/or family members. It was really neat. Afterwards we went to dinner. Again, all tallied, as a team we spoke to 35 people, of which 18 accepted the free gift of salvation found in Jesus! An awesome, packed day to be sure. We had a great time in Sacalaz. Friday was slated as a “free day” where we could sightsee and shop. We have a scheduled “Victory Service” where all of the teams will gather alongside the Romanian volunteers to hear all of what God has done in and around Timisoara during the week. Um…yeah, and we slept well!!! Today was a “free day”. A chance to see the sights, do some shopping and spend some time with your Romanian National team. Mocanu picked us up after breakfast and our devotional time and took us to the center of Timisoara and dropped us off. We strolled through the primary square, which rests between the Orthodox Cathedral and the Opera House. We toured the Cathedral and checked out a few shops. We then walked to the mall, where we did some more shopping, had lunch and hung out. After a while longer, Mocanu picked us up and took us back to the hotel, so that we could get showered up prior to the Victory Service at Golgotha Church. The Victory Service was great. When all of the teams were together, we did some Romanian praise and worship, and listened to Catalin (the Romanian coordinator for the campaign and great “friend of the e3 family”) and Sam give a few messages – of praise and encouragement to the Romanians. Sam reported that over the week, collectively the teams made over 1,500 gospel presentations with 641 professions of faith in Jesus!! WOW. I was really surprised that there were that many but thankful that we were a part of something so massive. We are praying that the Lord will continue to grow those new Brothers and Sisters in Christ. The Romanian mission point directors/pastors were asked to come down front to be recognized. Then the American team leaders were asked to come forward to pray over our Romanian brothers and commit them to the Lord and commit the work that lay before each of them to Him as well. As we prayed, (I got to pray for Mocanu) I could sense the overwhelming emotion of the moment come over Mocanu as we prayed. It was extremely moving. We cried and hugged one another. I was thankful for my time with Mocanu. He is a wonderful, passionate Christ-follower with an awesome heart for people. Cenei and Sacalaz are in capable, humble hands that are guided by Christ Himself. When we wrapped up the service, we were ushered back to Mocanu’s office to exchange gifts. It was a fun and yet, sad time as well. We would miss these guys a lot. We took massive amounts of pictures and headed out for dinner on the river. I am not sure if we will get the chance to go back to Romania or not, but I know that Lauren would LOVE to go back. Regardless of whether we do or not, it is comforting to know that we WILL meet again and get to spend eternity with one another. Looking back over the week, I really am amazed at what the Lord did – in us and through us. And as ususal, I feel like I was WAY more blessed as a result of serving than I feel like I contributed. I am humbled in so many ways. Most of all, I thank God for the opportunity to lead my daughter in this kind of work. Lauren has grown up watching Ellen and me serve in our church in different capacities and have even grown up with a lot of the high schoolers that we used to work with in youth ministry. However, this was the first time that Lauren and I were able to serve as equals – Brother and Sister in Christ – stepping out in faith and coming alongside what God is doing in Romania. Thanks again to all of you who contributed your finances and your prayers to send us to Romania. We trust that you have a little better understanding of what your “return on investment” is as a result of this report! You truly have made an eternal investment that cannot be measured by the world’s standards. We enjoyed being your ambassadors! 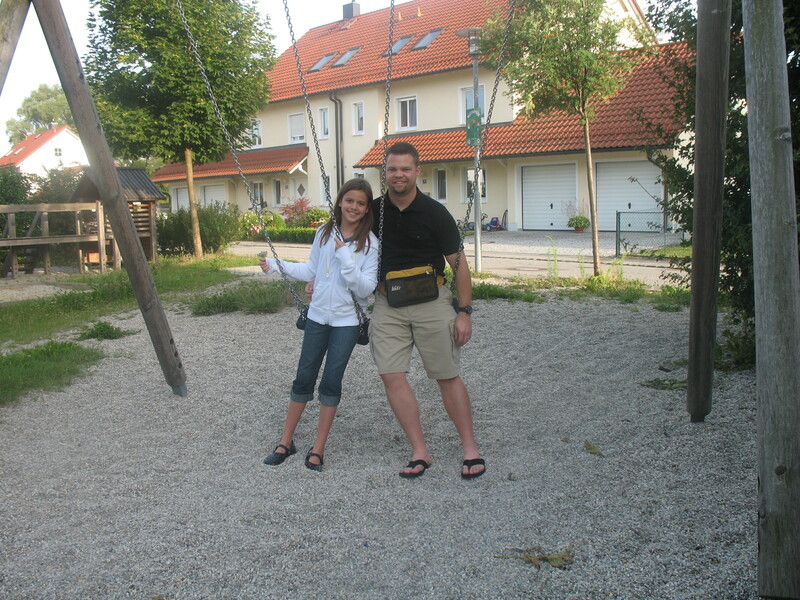 Day 9 to 15 – Saturday, July 7th, 2007 to July 13th – Timisoara, Romania to Rome, Italy and beyond! VERY SHORT NIGHT! Got to bed about 1AM and woke up around 3AM to catch the 3:30AM bus. When we got to the airport at 4AM, we found out that our flight out of Timisoara for 6AM had been CANCELED!! Woof. Thankfully, Lauren and I were able to get re-routed to Budapest and get to our next destination of Rome, Italy – 2 hours prior to when we were originally supposed to get there! The rest of the American team were able to get out later that day and had an uneventful rest of the trip I am told. Lauren and I however, continued our adventures together. We met Ellen in Rome (thank you again Jack for your Advantage Miles!!!!!) and spent the following week in Rome and Florence and had a wonderful time. * The cell where Paul & Peter were incarcerated, and where we think that he wrote 2 Timothy at least. * …and all the other really cool “old stuff”! It was the coolest to spend this time with my girls in a beautiful place like Italy!